10 May 2011, 12:37 PM. Let’s face it – aerial battles are awesome, regardless whether they involve planes, helicopters, jetpacks or living, breathing creatures. If done well, they can elevate pretty much everything. Including that godawful Eragon movie. Say what you will about it – and you would be right to do so – but you have to admit that the flying scenes were pretty damn neat. The movie Stealth, if we look away from the brain – dead dialogue, plot or just outright impossibilities was absolutely amazing when it came to the fights. TRON: The Totally Not a Remake Guys, ahem, Legacy had that amazing lightjet chase, the singular truly fresh piece of action it had going for it. And I am not even going to mention How To Train Your Dragon – that movie deserves a whole separate article. To me personally, however, the alteration of the aerial battle concept I always felt closest to was the one involving a creature. And I am not the only one – many authors have taken the concept on, some with success and some were not so fortunate or skilled. So inspired by a piece written by the ever so amazing Clibanarius, who had taken on the tactical and logistical aspects of this particular concept, I had decided to go further down to the basics – the creatures themselves. Because apparently, most writers think that wings is all that they need and they are good to go. This is not completely true. Before I get to the article itself, I will just say that I will stick to the nomenclature used by Clibanarius, so all them winged critters are going to be collectively referred to as “Dragon”, which will cover anything from the lizard through gryphons, giant riding birds, pegassi, wyverns and what have you. It is also their shape and size that is absolutely vital. Many writers I have come across have huge problems with this aspect of the flight, particularly in the respect of just what can the Dragon do while airborne. Most stick with “everything I can possibly think of” skillset, neglect to do proper research, or any research at all, and the result is a jumbled mess. The Dragon soars, sprints, hovers, plummets at great speeds, twists and turns. Many of these things, however, don’t go together – at all, in fact. The infamous Paolini (if you want to play a drinking game, take shot every time his name is mentioned and see how long you last) is a good example, I think, since Saphira displays the ability to do all of those things, yet it is never specified (at least there is nothing I would remember) whether her wings are sleek and pointed, long, broad or round. Take hovering, for example. This is my biggest personal peeve and whenever I see a hovering dragon, it always makes me groan audibly, since in most cases the author completely ignores everything such activity entails. Often the Dragon hovers for minutes on end, observing battlefields or doing similar tasks. Hovering is a very strenuous activity, it takes a great toll on the body of the Dragon. Level flight or soaring is one thing – the power of the motion that propels the Dragon forward provides opportunity for gliding and a brief rest. In level flight, once certain speed is achieved the Dragon can afford to make more shallow wingstrokes that don’t need to be as strong as when it first takes off, since the point is no longer to get to the air and gain speed, merely to sustain momentum. Hovering, however, is constant and continuous intense exertion. Even though the Kestrel is a small and non-impressive bird, it can do what no other species of birds of prey can. The signature hover is achieved when the bird flies against the wind at the same speed as the wind. In order to be able to achieve that, the kestrel has some unique features. Take another look at that picture. The wings are a bit shorter and rounder than is usual for a falconid, and the tail way, way too long, giving the Kestrel’s silhouette a look similar to that of a Sparrowhawk, which is known for navigating through forested areas filled with obstacles and short sprints. In the case of the Kestrel, however, the long tail acts as a sail catching the wind and the shorter wings do not allow it to grab the hold on the bird completely and move it from its spot. Kestrels, however, are not very fast due to these very same features. Of course, there are other means through which hovering can be achieved – hummingbirds hover and so do many species of flying insects. But the Dragon I considered for the purposes of this article was one large enough to be able to carry a grown man and for something that size, the type of hovering that hummingbirds are capable of doing would be physically impossible. The Kestrel, then, seemed like the perfect option for me, since, as far as I know, it is the largest bird capable of this sort of sustained hover, and therefore seemed more plausible a method for the Dragon. Speed and agility are another problem often encountered in the character of the Dragon. For example, the fast flight of the Peregrine Falcon, the fastest animal on earth, is possible due to long, pointed and powerful wings and very short tail, which gives the bird the perfect aerodynamic shape. On the other hand, the Peregrine is not very agile and will refuse to hunt in areas that have obstacles in the way, such as woods, due to its inability to abruptly alter the course of its flight. The Accipiters, such as the Goshawk or the Sparrowhawk with very short, round wings and long tails are masters at that. The large tail is a rudder and quick shifts in shape or position allow the Accipiters to change the direction within a split second. This wingshape is also ideal for short – distance sprints, but not at all suited for soaring, since the smaller size of the wing makes it more difficult for the bird to hold on to the currents properly. A soaring Goshawk is a very rare sight. For that sort of thing, broad – winged birds are best. It makes the bird more stable in the air, the weight is spread over a larger surface of support. The short tail is perfect for adjusting the slower, searching flight, since no abrupt shifts in direction are usually needed in the open skies. Sometimes it is not even the shape or form of the wings themselves, rather than the feathers. Wingbeats can be pretty loud, with a falcon that has stiff, hard feathers due to aerodynamics reasons, you first hear the whizzing of the air on the feathers before you even see the bird. And the larger the bird, the louder the wingstroke. The Dragon in particular would be ill – suited for stealthy tasks, such as intelligence gathering, when every time it beats its wings, the giant wingspan makes it sound like a loud thud. Certain alterations have to be made. Owls have very soft feathers with ragged edges, which does a great deal for reducing the noise. It makes them look fluffy, but it also makes them perfectly silent. The threads that make up the feathers are covered in very fine hairs, so the surface of the feather feels like velvet. You can only see a flying owl. But there is no way you would be able to hear it. Another element that may come into play and therefore alter the appearance and abilities of the Dragon, is water. The preening gland, located at the base of the tail of various kinds of waterfowl like ducks, geese, swans etc. produces a certain type of greasy matter, which they spread over their feathers while preening, making them waterproof and allows them to take flight immediately after diving or swimming. Other birds that are not so closely bound to water have the gland as well, however, this protective coating is not as efficient, since they don’t really need it to be due to not coming in contact with water all that much. Water is a tricky thing – when the feathers get soaked, the bird becomes too heavy to fly and soaked feathers lose some of their quality and texture needed for sustained flight. Wet birds are awkward and uncoordinated in the air, if they are able to take flight at all in this condition, and have to wait for their feathers to dry before attempting a take – off. Activities like bathing, though, are very vital. A clean and healthy feather is a happy feather, less prone to damage. This aspect too is often overlooked when the writer constructs the Dragon and it makes for some horrendous writing – e.g. when in Eragon Saphira takes flight immediately after having dived into a lake. True, she is a dragon, she has scales, which do not soak up, but the water clinging to the surface still adds extra weight and should make it more difficult for her to move around. The bottomline is – the shape of the wings, the tail and the type, state and texture of feathers determine the abilities of the flier and, since in this instance we are talking about the battle applications for the Dragon, the role they serve in the army as well. Are they reconaissance? Take something with broad wings and a short tail. Does the task need to be carried out discreetly? Give the Dragon owl wings. Something that looks roughly like a goshawk would be best for ambush attacks and if a message needs to be urgently delivered, long, pointed wings are the way to go. Aerial battles, while being about the most exciting thing one can imagine, sadly often get boring. The Dragons circle each other, they bite and claw and that is the extent of it. But for example, how would a Soarer deal with an Ambusher as a foe? What if something that can stoop did just that in order to deliver a blow that would stun the opponent, or even kill them? How would that affect designing battle strategies? What units could be created? Wouldn’t that be interesting? Aerial predators are a very unsociable bunch. Any other bird of prey that appears in the vicinity is a potential threat. So much so that the sexual dimorphism of these predators is based around the very fact. In birds of prey, the female is typically one third larger than the male, although the size ratio varies with individual species, with the most extreme being the Peregrine Falcon and the Sparrowhawk, wherein the female is roughly twice the size of the male. The primary reason for this is that when a larger predator enters the vicinity of the nest, the small, helpless chicks are too easy a meal to pass on and the female needs every last ounce to her size and strength to be able to defend her young while the male is off hunting for the whole family. My point is – predators are aggressive towards each other, since they perceive the other as a threat and that aggression is so deeply rooted it not only affects their personality, but also physical appearance. Many authors skip this inherent animosity by waving it away with the excuse of giving the Dragon intelligence, completely overlooking the interesting implications that could have for the layout of the army camp – for example, if there are three Dragons present, how would the General deal with them? How would he curb their distaste for each other? What if one of the three is a member of a species that in the wild routinely raids the nests of the other two? How would their inter-character dynamic work out? However, not even birds of prey are strangers to social behavior. The Harris Hawks, which can be found in the wild in both Americas, are the only social birds of prey in the world. They live in large families or clans, in which all adult members participate in group hunts – they devise strategies, are incredibly intelligent, and learn and devise new techniques as they go along. Younger birds from clutches from previous years, that are still too young to have eggs of their own, stay close to parents and when another nesting season comes, take turns to help raise their younger siblings. In falconry applications, the Harris Hawks are also known to have accepted members of other species into their “clique”, such as Goshawks, which anatomically and skill – wise (though not intelligence – wise) are their closest European counterparts. Consider the importance and utility this would have in a combat situation – you can have the social Dragons perform elaborate attacks, with each member of the team being assigned a specific role. You can have them fly in formation, even ones that include members of other types of Dragons. In fantasy literature, this was masterfully pulled off by Naomi Novik in her Temeraire series, and I think, is much more interesting than the clichéd, er, time – honored “Dragon dive, breathe fire” approach, which is about all that the Dragon ever does in traditional fantasy. Now it was already mentioned how the anatomy of the Dragon influences its hunting and killing abilities and I briefly talked about different approaches to killing and combat in the air. Flight precision, however, is not the only thing that should be taken into account when designing the Dragon. When it comes to melee fight, the Dragon can traditionally bite or claw its opponent to death. How would it go by it, though? But same as with flight you cannot have great speed and agility both, you also cannot have a great hold with great gripping power. The Falcon’s feet are not particularly powerful; true, it still hurts when one decides to claw you; but compared to some others, as will be mentioned later, its grip is pretty weak. What the Falcon relies on for killing, is its beak. Very short and heavy, it also sports a tomial tooth on the upper jaw, which gives the beak a fanged and savage appearance, but it also serves another purpose – with its special beak, once the prey is immobilized, the Falcon bites its neck, snapping it in an instant and killing the prey immediately. The Hawk has devised a different strategy. While its beak is generally sleek and not very strong, the Hawk has another thing going for it – its feet. Incredibly powerful, with large, heavy claws, they can deliver gripping power that can crush bones (the Eagle in particular is very skilled in that respect and in a very literal way). The Hawk hunts using intuitive knowledge of its prey anatomy and behavior – it either goes for the head, immobilizing it, or after the spine, along which most of the vital organs are located. By grabbing onto it, there is a chance the long claws will puncture some of them, causing fatal damage. The killing itself, however, is not as clean an affair as in the case of the Falcon. The Hawk grabs and simply waits until the prey bleeds out or expires due to organ failure. This is another reason why powerful grip is required – the prey will not sell its life cheaply and before it dies, it thrashes around, trying to shake the Hawk off and run away, which is what often happens. How would that come to play when we talk about the Dragon? Like with the wings, the killing approach will show on the Dragon’s appearance. Will it have a heavy jaw and head, or are the feet and the claws its most prominent feature? How will the killing strategy play into combat and mission deploy? Is a fast, quiet kill needed, or does it not matter in the heat of battle? The Dragon’s claws and teeth are just as important a tool as its fire – if the Dragon has it – and playing around with these could make for some interesting combat. I have to cut the article here due to size, since I possess no restraint or ability to express myself without going on long – winded rants. The second and final part will deal with things like limitations of the Dragon’s skills and physique – that come from both inside and outside the Dragon, boot camps and human partners. That was a very good and well-thought-out article. Plenty of people compare dragons to raptors, but this is the first place I’ve seen someone go into all that that would mean. Very interesting! And most useful, if I ever write something with dragons in it. I’ll be sure to bookmark it. I agree with everyone! Great article! Oh wow, you guys, thank you SO MUCH for all the kind words:) I am very very happy that you took your time to read it and even liked it. And as always, I think it would unfair not to link your fantastic article, Clibanarius! @ dragonarya – but dragons are always more interesting! Wing noise aside, I think dragons are too big to be used for recon missions. You’d need the wizard’s familiar owl or crow for that. Hovering is a very strenuous activity, it takes a great toll on the body of the Dragon. Especially since they’re usually friggin’ huge. Also, that Kestrel… it has a tail that looks like a fan. In other words, a bird’s tail with actual feathers. What would a scaly, reptilian tail look like if it were designed for hovering? Different animals have different strong points. but dragons are always more interesting! Which is why I’m using a bunch of very different dragon species in my new WiP. Just for interest’s sake, how would you classify the wings on this bloke, empress? Btw, it’s not mine – I can’t draw very well at all. Hmm, I seem to recall some fantasy book/movie/game where some dragons had like a “fan” of feathers or scales at the end of their tail, but I can’t remember what it was. Actually, come to think of it, it may have been the Dark Griffin series, in which case it was griffins I was thinking of, not dragons. Out of curiosity, falconempress, have you read those books? And if you have, what did you think of the griffin combat? You bring up some interesting issues. Much like Swenson pointed out, I suppose it could work if the tail had some sort of a fan of feathers at the end or a spreadable fin/membrane of sorts that would catch the wind. The first dragon looks like it has short, round wings – the membrane seems to be fully stretched on the picture; the second set seems long and pointed, judging by the overall shape and gaps between “ribs” (folded falcon wings look a bit like that, actually). @Swenson – Yes, I read The Dark Griffin and the did too have those fans at the end of their tails – the author, in fact, said that she gave the griffins those in order to give them the ability to steer their movements in a three – dimensional space. As for the griffin combat in the books – I found it clean and fast – paced enough, also lacking in outright stupidity to actually stop and examine it closer. Also, I might have forgotten a lot of it, since it has been a while since I read any of the books. But I dont remember anything that would make me go “hang on a second, this is not right”. 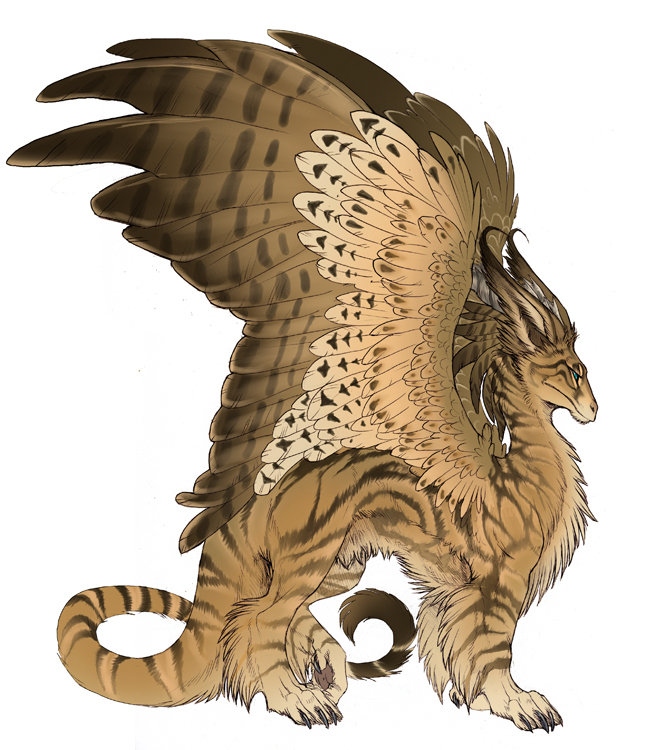 Anyways – well, I suppose if the Dragon had soft “fur” of sorts and owl – like feathers, it could work. Like this? Wow, that’s beautiful! But I was thinking that dragons are both uncommon and very big, and thus would find it almost impossible to go unnoticed by the enemy. Now, if the lovely beastie above where owl-sized, perphaps it might work. Naomi Novik had one of those specially bred nocturnal dragons (because Naomi Novik can do no wrong :D) – they were called Fleur-de-Nuit or something like that and were a part of the French air force in the wars with Napoleon (dammit, the Temeraire series is awesome). I figured the darkness would do a lot to hide something this big, but your concerns and thoughts are more than valid. Agreed! What an awesome-looking creature. So the first dragon would be the type that soars, and the second one would be like a giant fire-breathing Peregrine Falcon? Cool. I remember drawing a comic (pretty damn badly, like I said) in which a bad guy sent two different dragons (as well as a couple other monsters) to end some unlucky neutral guy. One dragon had the classic “dragon” wings; ribbed webs between fingers, like a bat. The other one had long, thin, pterodactyl-like wings; arm ending halfway into the wing (with a clawed hand), little finger stretching all the way. P.S. Have you read Dragonlance, by any chance? In Dragonlance, one evil dragon used a magic spell to create darkness. So the first dragon would be the type that soars, and the second one would be like a giant fire-breathing Peregrine Falcon? The second is correct, it would be much like a Peregrine. The first, however, would not be much of a soarer – the wings are too short and round for that. It would be an ambush attacker relying on short-distance sprints and great agility to hunt/fight. No, I have not read Dragonlance. Is it good? The first, however, would not be much of a soarer – the wings are too short and round for that. It would be an ambush attacker relying on short-distance sprints and great agility to hunt/fight. Oh okay. Makes sense – especially since its body is pretty heavy compared to the wings, too. That’s something I had never thought of. I would be intrigued to see an author actually address those sorts of issues. Then again, considering that throughout the medieval period, cavalries used primarily stallions for fighting horses and preserved the animal’s fighting instinct, temperamental dragons would not necessarily be much different. Provided a dragon (or gryphon or other exotic critter) was raised from infancy, it would be trained to accept the presence of other dragons. In the real world, if a warmount was unmanageable and a threat to other horses, it became a liability and the rider may have had to obtain a different one. There’s even reference in a manuscript to a knight who had to kill one of his destriers while on campaign because it endangered the other horses. And please forgive the double-post. I forgot to mention what a well-written and insightful article this is. Well done! This article is very well written. I’d have never thought of very many of the things mentioned in it at all, if any. Now I just have one question: What about aerial warfare that isn’t fought astride insert element here-breathing dragons, but from the cockpit of a starfighter, or fighter plane? @LuminousMink – I did not touch on that topic, because I know nothing about it. At all. So to answer your question – I have no idea. Yes, you can lower the likelihood of a specie naturally distrustful of a different specie by introducing the element of the different specie to the creature in question since infancy. But not eliminate it entirely. For example, for some mysterious reason, Harris Hawks are born with a deadly hatred and fear of dogs or anything canine pretty much hard – wired into their DNA. All of them. By a means of training and exposing the bird to dogs since young age, this may become less of an issue, but the bird will always be a bit suspicious and never fully trusting around one. This is similar to the animosity between diurnal and nocturnal raptors – both these groups raid the nests of each other and bully each other during their respective activity peak time-frames and as a result, they absolutely loathe each others guts. In the past, this was used to curb the raptor population by the farmers – they would catch an owl, tether it in the middle of a field and within minutes, anything with a hooked beak and claws in the 10 – mile radius would come to teach the nocturnal intruder a lesson. This atrocious practice is, fortunately, banned nowadays, but ornithologists still use a modified version when they need to trap wild raptors for banding and fitting them with microchips – they use a captive – bred, trained owl to lure them in, band them and let them go again. Sometimes there can be a multitude of birds in the air, not only raptors but also crows and ravens – not attacking and tearing each other apart, because for the moment they are united by their hate towards a common enemy. This carries on even to the captive – bred and trained animals – they may be okay with being around each other, but their inherent distrust is so great, they keep an eye on each other and get alert at the slightest quicker move of their neighbor. As for just getting rid of an unruly dragon or other creature – sure, that is always an option. Although I suppose it depends on just how rare the Dragons are in the given world and what their values is. So if the Dragon is something quite uncommon, the General would be more likely to accommodate the Dragon by changing the things it is unhappy with rather than get rid of it, if the benefits outweigh the trouble he would have to go through to achieve that, I suppose. If you’d like some truly fresh aerial fighting, I adore how Scott Westerfeild wrote out his alternate histories in Leviathan and Behemoth. © 2008-2016 ImpishIdea and Falconempress, all rights reserved.